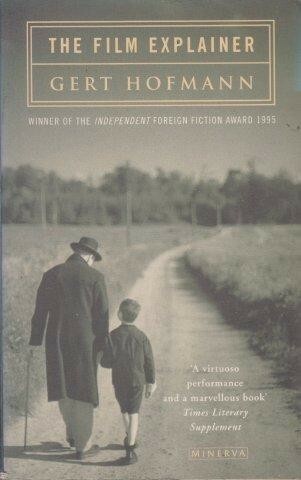 A couple of years ago I read Gert Hofmann’s The Film Explainer, winner of the Independent Foreign Fiction Prize in 1995, during German Literature Month, an experience which left me intrigued to explore his work further. As luck would have it, I came across a copy of The Parable of the Blind earlier this year (Hofmann’s work is largely out of print – though, unknown to me, this particular novel was reprinted by Verba Mundi in March). 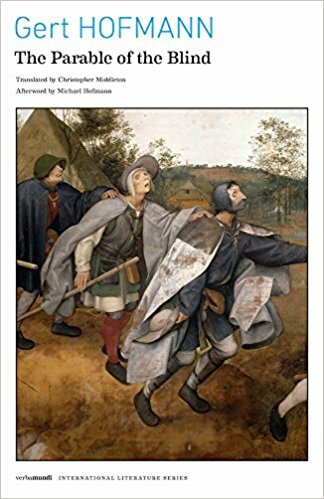 The novel, translated by poet Christopher Middleton (one of three Hofmann novels he translated), not only shares its title with that of a painting by Pieter Bruegel the Elder but seeks to describe the origins of that particular artwork, narrated entirely by the blind men who have been assembled by Bruegel to model for him. The Parable of the Blind is an impressively sustained exercise in limited viewpoint, and also interesting simply in its portrayal of the immortalised but forgotten models of the painting. However, it can also be read as a parable itself, a tortured Pilgrim’s Progress, where we are the blind leading the blind with death hovering above us, shouting our questions into the darkness. As the Independent Foreign Fiction Prize is absorbed into the Man Booker International Prize, it seems an opportune time to take a look at a past IFFP winner, Gert Hofmann’s The Film Explainer, translated by his son Michael. Coincidentally, this German novel was the last to win the prize in 1995 before it became dormant for five years; this year’s second German winner sees it disappear (in name anyway) again. 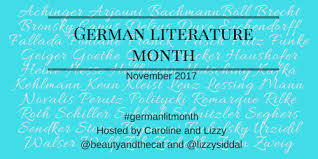 Both novels deal with Germany’s problematic twentieth century (cynics would say that an IFFP jury loves anything connected to the Second World War), though Hofmann’s take on it is more traditional. Dispiritingly, the novel, like most of Hofmann’s work, is now out of print: yesterday’s prize-winners, it seems, are tomorrow’s fish and chip papers. On any visit to another town, inspection of the cinema is mandatory. His job, however, is threatened both by diminishing audiences and the arrival of sound. The cinema’s owner believes the talkies can save his business; at the same time they will make Grandfather’s role redundant. Hofmann shows us, in miniature, the way in which individuals can be attracted to extremism: when everything else is taken away from them. Luckily his love of film ultimately saves Grandfather: when on a rally, he abandons the flag to visit the nearest cinema. The Film Explainer uses its provincial, unimportant characters to reveal a little of the process by which a country can lose itself. Perhaps its greatest achievement, though, is its wonderful three-layered narrative voice in which the Grandfather, the Grandmother and the grandson unite to tell their story. You are currently browsing the archives for the Gert Hofmann category.